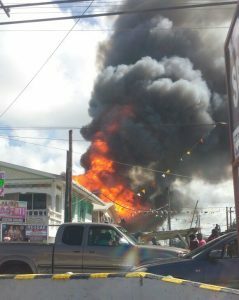 About 40 persons were rendered homeless Friday – Republic Day- when fire ripped through several buildings at Plaisance, East Coast Demerara. Eyewitnesses said the fire started at a decades-old “Abiola Hotel” on Victoria Road just over the Plaisance Railway Embankment Road. An estimated 30 persons lived at the hotel permanently. The blaze also spread to two buildings in the same yard with the hotel and another next door. The Abiola Hotel was owned by the Cummings one of whom is well-known as Chico. Previous: Police Commissioner Seelall Persaud retires. Who will take over permanently?